The Broken Christmas Tree – Released Oct 2014. 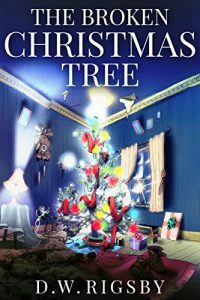 The Broken Christmas Tree is a Christmas story set in the 1980s with supernatural elements. Furthermore the words carry passion, emotion pours out on the page. Inside is a message, if you can find it. You will laugh, you will cry, and you will feel sad at times. You will experience a journey with Danny, and Cluster. You will see the worst, and you will see the best. You will experience ups, downs, and the power of story. I am the author, D.W. Rigsby, of the The Broken Christmas Tree my debut novel and I love it! I never wanted it to end. Each time I got closer to the end I wanted to break down and stop. Because it was a powerful experience for me. Therefore I present to you my work, my long nights, my doubts, my fears, but most of all my love. This story is powerful, it’s astonishing. Don’t miss out. Read The Broken Christmas Tree. Finally this Christmas story set in the 1980s is about twelve year old Danny who is no ordinary child, and it’s a wonder his family is even making ends meet. He’s desperately worried his mom has given up on Christmas. Danny sets out to make things right in the frozen wilderness to face dangers which will test him. He needs to find a way to brighten his mother’s life, to help her to see the world as he sees it and not to give up even when all seems lost. Come and read this non-traditional Christmas book and find out what happens.